He's the other Toronto Maple Leafs draft pick at the World Junior Hockey Championship, yet Russian defenceman Rinat Valiev isn't getting much love – or notice – from the Air Canada Centre crowd. He appears to be fine with all the attention on William Nylander. The Maple Leafs second pick last June (3rd round, 68th overall from Kootenay Ice) is just thrilled to be playing at this event in a place he hopes will be his NHL home one day. 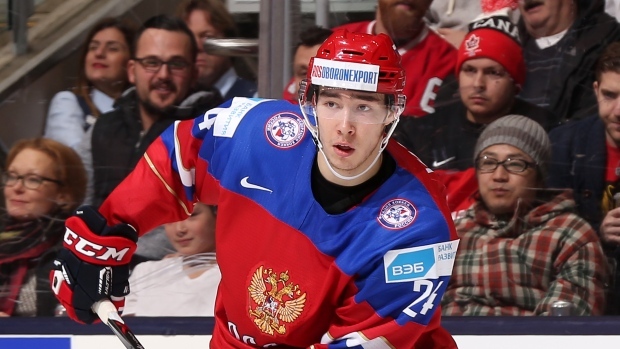 "It means a lot for me," said Valiev, following Russia's 3-2 loss to Sweden on Monday. "I like it here. It's a huge dream. I'm so excited to play here." Valiev left his Russian home of Nizhnekamsk (1,000 kilometers east of Moscow) when he was 17, to play in the United States Hockey League with the Indiana Ice. He has spent the last two seasons with the Kootenay Ice of the Western Hockey League. He was hampered by a knee injury last season and has shown he is fully healed now. Before he joined the Russian team, he led the Ice defencemen in scoring (5G, 20A in 23 games). His strong play in the playoffs last season for Kootenay (1G, 8A in 13 games) left an impression with the Leafs. After he went undrafted in 2013, the Leafs made him their next choice after Nylander last June. "He was exceptional (in the playoffs) especially in the first round when they upset Calgary," said Leafs scouting director Dave Morrison at the draft. "We really liked him all along and then we saw that. This is a guy with a big heart and all the intangibles we look for in a player." "To see Rinat on the ice in the last few seconds of a game (as he was in the game against Sweden), killing penalties at key times, we couldn't be happier," said Steve Staios, the Leafs Player Development Advisor, following the game against Sweden. "He's a terrific kid," added Staios a veteran of 1,001 NHL games. "He wants to be a player. There's a lot of upside. I like the way he moves on the ice. He's a good first passer. Fundamentally, he's sound." The 6-foot-2, 208 pound Valiev signed an entry level deal with Toronto in July. While Staios doesn't like to make comparisons, Valiev's play reminds some of another former Leaf blueliner, Dmitri Yushkevich. "He's in a good place in Kootenay," said Staios. "They rely on him heavily. It's been a steady progression for him." The 19 year-old Valiev is quick to credit Staios for helping him out prior to the season. Staios spent a few days with Valiev and worked with him on the ice. "Steve Staios is helping me a lot," smiled Valiev. "He came to Kootenay and he showed me a lot of things; skating movement, shooting the puck, stuff like that." Valiev is excited at the prospects of facing Ice teammate Sam Reinhart – "hopefully in the final" – at this event. During the game against Sweden, the Air Canada Centre crowd cheered loudly during a highlight montage of William Nylander (Toronto's first round pick last June). Valiev didn't notice. "I didn't really hear that. I was trying to focus on the game." "He's a good player (Nylander had two assists in the game) and before the game, coach told us to play hard against him, I know that." Maybe one day, Valiev will get his due in Toronto.